August 22, 2018 -- When it comes to potential drug mules, it's vital to remain vigilant and become familiar with where the packets may be hidden and how they appear on both CT and x-ray images, according to new research. 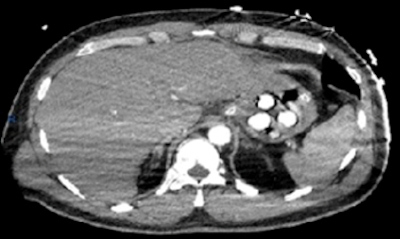 "Suspected body packers are often identified by customs authorities and admitted to accident and emergency (A&E) for further medical evaluation, which includes identification of body packing using imaging," noted Dr. Nirav Bhatt, registrar in clinical radiology, and colleagues at Luton & Dunstable University Hospital in Luton, U.K. "However, occasionally the packets are detected incidentally, and it is therefore important to be familiar with their appearance." Acute drug toxicity can be a serious problem, they told delegates at the recent U.K. Radiological and Radiation Oncology (UKRCO) congress in Liverpool. In one case, a 43-year-old man presented with an out of hospital cardiac arrest upon arrival at the airport. After being transferred to A&E, he was resuscitated and a CT pulmonary angiogram was performed to exclude a pulmonary embolism. No embolism was demonstrated, but four well-defined radiopaque densities (~300 Hounsfield units) were identified in the stomach. CT pulmonary angiogram of a 43-year-old man who presented with an out of hospital cardiac arrest. No embolism was detected, but four well-defined radiopaque densities (~300 Hounsfield units) were identified in the stomach. All images courtesy of Drs. Nirav Bhatt and Sheena McLaggan. "Gastroscopy was subsequently performed, which confirmed four white pill-shaped packets," the researchers recalled. "Two empty bags from burst packaging were removed. One of the foreign objects was removed with a two-prong balloon grasper." The patient then underwent laparotomy for surgical removal of three packets from the fundus of the stomach. Unfortunately, the patient was unable to recover and died, and a toxicology screen confirmed the presence of cocaine. In another case, a 24-year-old woman was found to have a foreign body lodged within her vaginal cavity. On x-ray, a solitary well-defined radiopaque density was lying within the pelvis, outside of the bowel lumen. 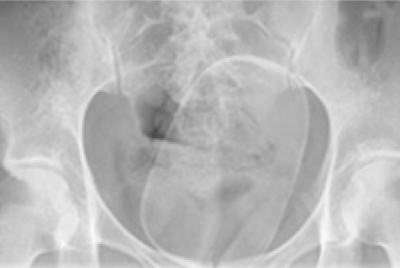 The patient required examination under anesthetic, episiotomy, suprapubic pressure, and manual delivery of a plastic cylindrical mass weighing 288 g.
X-ray of 24-year-old woman shows a solitary well-defined radiopaque density lying within the pelvis, outside of the bowel lumen. The authors have also encountered cases of colonic packing. They have seen smooth, well-defined radiopaque densities -- sometimes variable in size and shape -- scattered throughout the bowel lumen. 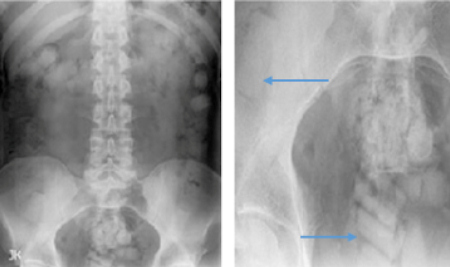 The characteristic 'double condom' sign may be visible, and the complications can include bowel obstruction or perforation. "Cocaine and heroin are the most common drugs involved, posing a serious risk to the individual," they commented. "Body packing describes the internal concealment of drug-filled packets into a body cavity, either by ingestion or insertion, generally with the aim of smuggling them across a border." The drugs tend to be concealed within condoms, latex, foil, and cellophane, and the majority of presenting patients are young men. The average age of drug mules is around 30, and about 80% are male. Most patients are asymptomatic, but they can present with symptoms of complications, such as perforation and obstruction, or drug intoxication, which may be intentional or unintentional. Additionally, urinalysis may be positive for illicit drugs. X-rays show smooth, well-defined radiopaque densities scattered throughout the bowel lumen. Blue arrows demonstrate the characteristic 'double condom' sign. CT and x-ray facilitate evaluation for associated complications of gastrointestinal obstruction or perforation and are less limited by visceral gas. Ultrasound may be useful in younger patients, particularly in pregnant women. Appearances vary depending on the method of concealment, but are morphologically similar to those on CT.
Up to 95% of asymptomatic cases are treated conservatively, for instance with laxatives. Symptomatic or complex cases may require laparotomy and surgical intervention for complications. To view the group's UKRCO 2018 presentation (number E071) on the congress organizer's website, click here.